Looking up a city street, there’s a perfect square snapshot of the Hills, sunlit and framed against the dark buildings. The other way, the sun falls across the street in angular slabs transforming it into a channel of light; dissecting and connecting, Hills to Sea, point to point. The physical nature of chemical photography, the fact of light falling onto paper or plate gave rise to the myth of its truth, this and the documenting of Indigenous experience by others over our history has been a driving force for Indigenous artists taking up the camera. In BITE, the photo media artists have harnessed photography’s truth telling conventions and carved out spaces that encompass these different histories and perspectives and cunningly reframe and represent national mythologies. 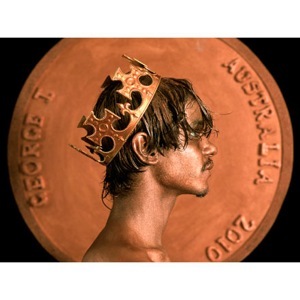 BITE shows off the Flinders Art Museum’s recent acquisitions of contemporary Indigenous artists and, as well as a substantial swathe of arresting photo media works, includes some exceptional print works. 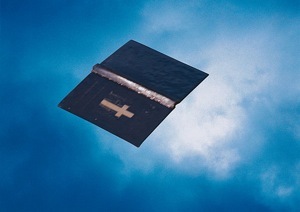 The shimmering Bible floating in the big sky of Michael Riley’s Untitled (Bible) (2006) from his Cloud (2000) series is gently seductive and subtly subversive. The Bible floating upside down, pages open and detached from institutional power doesn’t seem quite itself. On its own, it is leached of power and it is the numinous blue sky that represents place, spiritual presence and force, shifting and evolving beyond the range of symbols and forces imposed on it. At the Festival last year, the whole series of Cloud was shown as a continuous banner above North Terrace. At home in the sky, Bible, boomerang, angels, locust and a cow, floated, pierced by light an elegant and profoundly rich and moving storytelling. As the autumn light here carves the city up into so many pieces of yellowish cake, the soft light that falls down the hill of the unknown city street in Brenda L Croft’s Man About Town (2003) is familiar but dislocating. 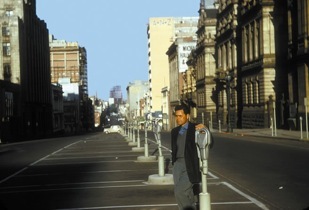 A well dressed man stands alone in the city street, unstaged, this is an actual image of Croft’s father in this unidentified time and place. Like a film still it suggests unlimited possible narratives yet offers an image of Indigenous life of that time outside the accepted national imaginary, both unsettling this history and making it more mutable and complex. The slick reflective surfaces of Darren Siwes’Gold Boy, Silver Boy, Bronze Boy (all 2007) and Golden Female (2008) make evident subsumed notions of society, exchange, colour and human worth. 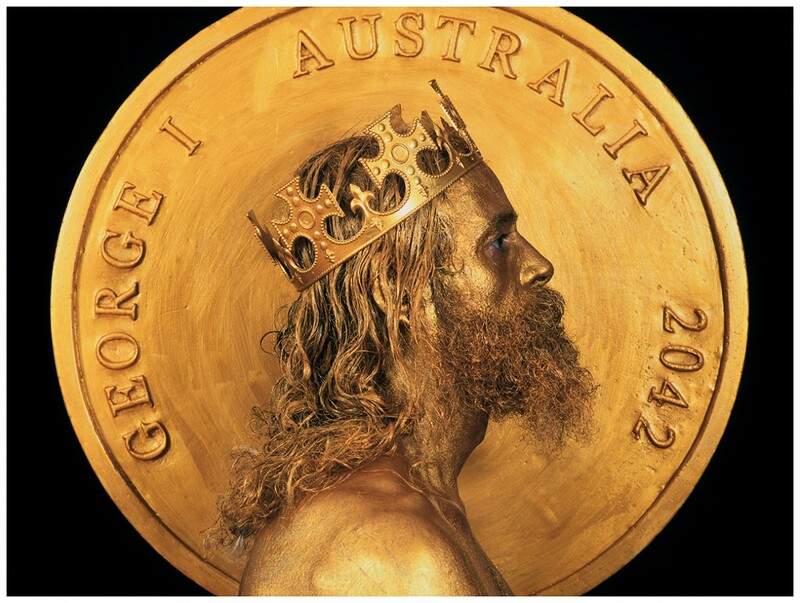 Using the classical caste system of Gold, Bronze, Silver, and the symbol of the coin itself as token of exchange value and as cultural memory Siwes Boy and Queen skin gilded, silvered and bronzed (a take on the Bronzed Aussie?) assume power quietly and in recasting this alternate history, brings what was and is into view. Fiona Foley’s HHH 1 (2004) directly references racial conflict in a sea of colour, the seven members of the Hedonistic Honky Haters clad in shiny black KKK hoods and vivid African fabrics stand against neutral shiny white. Real or not the HHH foregrounds this history of hatred and all the inscriptions of meaning on colour, are the HHH good? Bad? Whose side are they on, haters or hated, they reveal the meaning of these colour codings (black as bad, white as neutral, the codings of the “ethnic” cloth, that the HHH members are black upsets the coding of black as victim) they bring it all into question. Next to this the red, black and white op art field of Brook Andrews screen printBlack and White Special Cut (2005) seems to vibrate with its own ironic undoing of these same colour codings. Destiny Deacon ignores photographic gloss and finish in the snapshot style Goodie Hoodie Man B (2007). The man’s face covered with a white hood with a crudely drawn face calls up darker histories and invokes the recent surge of jingoistic Nationalism, Goodie Hoodie Man is deeply unfunny and laughable at the same time, underlaid with Deacon’s characteristic blak humour. Jonathan Jones embossed prints White Poles 1-3 (2004) with their shadow play of clattering, falling diagonals creates a subtle dimensionality. As the viewer moves around the prints, it seems that the interlocking mesh of lines will open out into a 3d space that one can move into and through. Jone’s work explicitly draws on the fluid lines of Tony Tuckson’s White Lines on Ultramarine (1970-1973) which was in turn a refinement of Yirrkala work collected by Tuckson and Johnson simultaneously pays homage to Pollock’s Blue Poles (1952). Working fluidly in both western and indigenous traditions, Jones’ subtle image of light and spatiality effortlessly connects these traditions. The repetitive whorled forms of Dennis Nona’s stunning lino print Ara: Boxing Waves (2006) flow and change across the large scale print becoming the unweaving story of the sea, the reef and the sea turtles that hide from the hunter under the “boxing waves”. The dense patterning embodies the currents and dazzle of the sea and the richness of these forms and transmission of cultural knowledge. All artists here play with light, as medium, as idea, it’s here in the refined shadow movement of Jonathan Jones’s prints and in the photographic gloss and complex codes of Foley and Siwes work, it’s here too in the plate tone of Terry Ngamandra Wilson’s beautifully spare etchings Waterholes at Barlparnarra(2007) and Gulach (2007) and in the fiery eyes of Nora Rupert’s’ spirit beings in Mamu(2003). As down a city street, light connects and reveals, illuminating and re framing what was thought familiar.